The Night in Bethlehem - An Oíche Úd i m Beithil - An Irish Christmas Carol for solo Irish Harp (or Pedal Harp) arranged by Anne-Marie O'Farrell. Two of the three tunes in this volume are attributed to the late Sean Óg Ó Tuama who came from Cork in the southwest of Ireland. He edited a series of Irish songbooks in the 1950s, An Cóisir Cheoil which included Bí a Íosa im' Chroíse and Don Oíche Úd i mBeithil, both of which are believed to have been composed by him, in spite of his own designation of these melodies as being traditional. Don Oíche Úd i mBeithil (The Night in Bethlehem) is a Christmas carol to an Irish text by the poet and theologian, Aodh Mac Aingil Mac Cathmhaoil (1571-1626). The poem which describes the first Christmas is widely published in Ireland, and is also found in the Irish Church Hymnal (2000). This arrangement is recorded on the album, The Jig's Up, CD1903. An Raibh Tú ag an gCarraig? (Were you at Carrick?) is a love song is by the blind harper from Tyrone, Dominic Mongan (1715-1796), and it is believed that he composed it in honour of a lady of the Blacker family. The song has been published in several songbooks throughout the twentieth century, many of which contain only two verses. Unusually, P.W. Joyce's Irish Music and Song, published by Gill in 1901, provides a longer text of five verses, which outline the romance of love accompanied by rhythm of the year and its festivals. 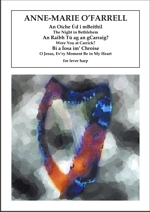 While the text of Bí a Íosa im' Chroíse (O Jesus, Ev'ry Moment Be in My Heart) is believed by some to be anonymous, the 1951 publication by Cumann Gaelach na hEaglaise, Leabhair Iomann Le Ceol cites P. Seoighe as the author of this poem of personal commitment to Christian faith. Lever changes are denoted by a stemless, diamond-shaped note head. Although the arranger has a preference for a tuning of A flat major, it is noted that many players prefer a tuning with fewer flats. 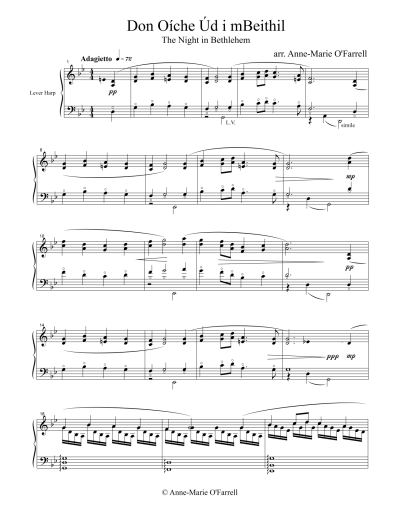 With this in mind, two of the original versions have been transposed to more accessible keys. An exception is made for An Raibh Tú ag an gCarraig? Since the original key of F minor utilises every string of a 34-string harp, and the transposition to D minor therefore requires minor adjustments to harmonic voicing, it is preferable to provide the arrangement in both keys. In the D minor setting, bracketed notes are to be played where no low A or B strings are not available.